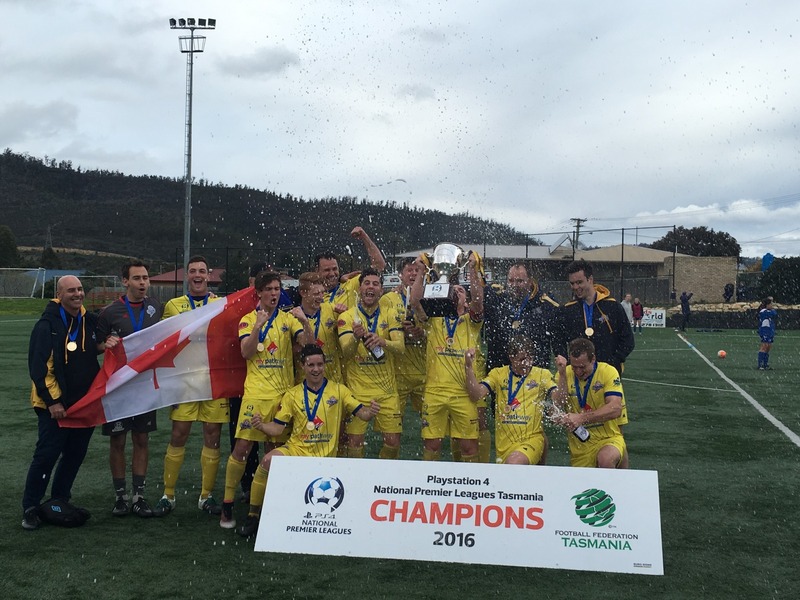 On the day they were crowned NPL TAS champions, the Devonport Strikers showed just why, putting in a superb display against the Olympia Warriors to run out comfortable 4-1 winners. Brayden Mann was outstanding up top, scoring a fine brace and Joel Stone did likewise. It was party time from the outset for the Strikers, who were clearly not going to rest on their laurels and were keen to end the season on a high point. Joel Stone opened the scoring on 23 minutes having already hit the post just three minutes into the contest and then two minutes later Mann doubled the lead with a perfectly placed shot. It was the kind of counter attacking goal that has been so customary for this side in 2016, the lightning fast transition play catching the Warriors flat footed at the back. Mann registered his 24th goal of the year to wrap up the golden boot award after he beat Vandermey all ends up and then finished with a clinical shot in the 36th minute. Stone thn made it 4-0 before half time as the jubilant Strikers went into the break in high spirits. The second half was less entertaining than the first with the majority of the highlights coming from Gavin Hoy. The Warriors midfielder unlocked the defence with some sharp skill a number of times and eventually scored the goal of the day when he jinked around two Strikers defenders in the box and beat Giantsopoulos at his near post to deny his compatriot a 15th clean sheet of the season. It meant the Strikers finished the season with a phenomenal 19-1-1 record, 8 points clear on top with a remarkable defensive record of just 10 goals allowed for the entire season. The Hobart JEEP Zebras bounced back from last weeks disappointment to register a resounding 5-0 win over Launceston City and end the season in second place. Having seemingly surrendered second spot after their implosion last week against South, the win over City, coupled with South Hobart's draw with Kingborough propelled them back above them and negate the damage of that game. They opened the scoring just a minute in through a familiar tactic, the long throw onto the head of Huigsloot causing chaos at the back and forging a chance for Sherman who duly buried it. Dwayne Walsh then earned his side a penalty when he was brought down in the box by David Smith but the City keeper redeemed himself as he saved the resulting Paul Stevens spot kick. Walsh himself took the next penalty when Leonard was penalised for a handball and Smith once again saved the penalty, but unfortunately for him Walsh was able to bury the rebound. Zebras were awarded a remarkable third penalty early in the second half as Ben Whitehall was brought down in the box and this time Smith couldn't save it as Sherman sent him the wrong way. With the score at 3-0 the game was all but settled and start to go through the motions till the Zebras made the win all the more emphatic with a pair of late goals. First Sherman picked out the head of Huigsloot with an inch perfect free kick to nod home before Walsh supplied McKeown with a fine cross which he duly buried. South Hobart were held to a 1-1 draw by the Kingborough Lions down at the Den and slipped to third place on the table. The Lions appeared to be on the way to taking all 3 points when Keiron Dale had them ahead only for Kobe Kemp to answer back in a hurry as South dominated the final few minutes but couldn't conjure a winner as the shares were spoiled. In a tight first half South had more of the ball but the Lions defended well and did a good job of repelling them. The few times South did break through Mark Grace was on hand to bail them out, making some quality saves. South definitely had the better of the chances but their inability to convert suddenly looked like it would come back to haunt them in the second half as Chris Downes came close from a pair of free kicks but James Wilson did well to deny him. Keiron Dale then bobbed up to put the Lions a goal ahead and have the Den roaring as an unlikely victory appeared on the cards. It wasn't to be however as Kobe Kemp, who dominated in midfield all day stepped up and dispatched a free kick past Grace who had been stellar in net and level things up with 8 minutes to play. Both teams pushed hard for a winner, with South coming the closest but neither could find it and both teams had to be content with a point. The Northern Rangers finally notched a win for the 2016 PS4 NPL Tasmania season. The Rangers went behind early before launching a spirited fightback to win 4-2 and avoid the dreaded goose egg for the year. It was 1-0 inside two minutes for Clarence as they stung the Rangers after a defensive lapse. Luigi Cordova, who was standing on the very right hand corner of his 18 yard box threw the ball towards Tenzing Anderson, who must have been napping still. He let the ball roll past him and Paul Bremner was on hand to collect the ball before smashing home into the empty net. In a chaotic opening, only two minutes later, it was all square again. Pat Lanau-Atkinson managed to work a shot off towards goals where Matt Dyson made an absolute meal of a pretty straight forward save and the ball found its way into the back of the net. The remainder of the half was a reasonably tight tussle played out in the middle third of the ground. Neither team was getting the upper hand until in the 39th minute, Hallard collected a red card for something he said on the park after a foul. The numerical advantage gave the Rangers their best chance of the year to collect three points. They came out after half time and took the lead in the 69th minute. Liam Appleyard lashed a strike home into the bottom left corner to make it 2-1 and threatened to run away with the game. In the 73rd minute it was 2-2 as Cordova spilt a high ball onto the ground and let it bounce up for Naden to head home from all of two yards out. Then it was the Rangers turn to take over. Youngster Joel Griffeoin stole the show with two well taken goals in the space of a minute. The first he raced onto a long throughball and then lobbed Dyson with a nice side footed volley as the keeper came charging out. The second of his two goals was a sweetly struck left footed volley into the bottom left corner that left Dyson with absolutely no chance to save it. It was a bittersweet result for the Rangers, their first win of the season on the last day of the season. But perhaps this is something they can build on for next year as they try to surge back up the ladder. For Clarence it was a disappointing end to the year but they have survived their first season in the top flight and acquitted themselves reasonably well and they now have a platform on which they can build upon. They are a proud club that will not be wanting to languish in the bottom half of the ladder for long.